The VM-1610 is a high-performance distribution amplifier for balanced stereo signals. 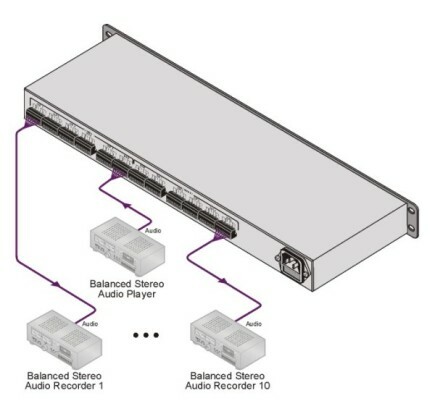 It can also be configured as two 1:5 balanced stereo audio distribution amplifiers. Dual Mode - Configure as 1:10 or 2x1:5 DAs. S/N Ratio - 92dB @1Vpp. Any professional A/V system requiring high quality signal distribution. Recording studios and live sound reinforcement systems. INPUTS: 2 balanced stereo audio, +4dBu, 50kΩ on detachable terminal blocks. OUTPUTS: 10 (or 2x5) balanced stereo audio, +4dBu, 50Ω on detachable terminal blocks. AUDIO THD + NOISE: 0.011% at 1kHz. POWER CONSUMPTION: 230V AC (115V AC USA), 21VA. PRODUCT WEIGHT: 2.8kg (6.3lbs) approx. SHIPPING WEIGHT: 3.6kg (8.0lbs) approx.